Gold Star job listings come with screening tools to help churches screen applicants. Churches who purchase Gold Star Listings have been able to restrict applications to candidates with certain levels of education and experience. Today we have released a new screening option for current church size. Churches can now restrict applicants to those whose current church size is 1000-1000 members, or 500-750, etc. This new field will help churches better target the candidates they are looking for. Candidates should edit their Account Profile to reflect this information. We have added fields for social media accounts like Facebook, Twitter, Linkedin, and Instagram for job listings and resumes. You will see new social media icons on your listing if you add them to your account. Visit My ChurchJobs to edit your Job Listing or Resume and add your social media links now! A live grenade lobbed into a crowd and a time bomb discovered with an hour yet to tick down call for different responses. One needs an immediate problem eliminator, the other a careful problem solver. The cruise ship crossing calm seas on a sunny day requires a different captain from what the warship heading into battle needs. The child with a tummy ache needs a different doctor from the child whose appendix could burst at any moment. Different situations call for different leadership styles. The same is true for the church. The great pastor of the past, if he was truly great, likely succeeded for one of two reasons: (1) he excelled in multiple leadership styles and changed them to meet the dynamics of the church or (2) the one leadership style that he had fit the church’s situation for that time. The first is rare and any church that has one of those pastors in its history should count itself as blessed. The second is more common. Neither is that helpful when searching for a new pastor, because the church of today is not the church of yesterday nor the church that it will become. The search for a new pastor should begin with churches examining themselves. But how can an unhealthy church take an honest look at itself. People at most risk are those who think they are healthy when they are not. Whatever information they are looking at is interpreted as “No problems here” or even worse “I look good.” The same is true for churches. I am a pretty healthy guy. I exercise regularly, eat healthy food as much as possible, and try not to over-indulge the bad food. Here’s what I have learned over the years. Healthy people never assume that they are healthy. They do not base their health on how they look, how they feel, or what they are doing or not doing. Instead, healthy people get regular check ups. All churches need regular check ups whether they think they are healthy or not. This is difficult to do, because there are no “church doctors” to give check ups. While some associational and denominational groups provide consulting help for churches, most churches will have to rely on self examination. How then can unhealthy churches realize their problems? The first step in searching for a new pastor is for churches to ask themselves questions regarding who they have been, who they are, and who God wants them to become. This takes seriously the biblical presentation of the church as the body of Christ in which members, including the pastor, are unique and connected to the other members. This means that the departure of pastors or any other members changes the church and that they cannot simply be replaced. Only by looking at who they are can churches begin to consider what kind of pastor God might be directing to them. By beginning with themselves, churches can create an environment that allows the new pastor to fulfill this biblical role in the unique way that God has gifted him. Read Part II: The Search for a New Pastor: The Often Forgotten First Step to find out more! Churches take many different approaches to choosing a pastor – some good and some bad. Of course, the entire process should be saturated in prayer. In fact, the whole process could begin with a churchwide call to prayer. Read Pastor’s Search Committee Guidelines to find out more! We have been busy over the weekend working on several new features and changes to our site. We think they make ChurchJobs.net a much better service, and we hope you agree. The first change you will notice is that all candidates must have a resume to apply for jobs. Churches have commented that when candidates simply email them a link to their resume our service feels fragmented. Therefore, we decided to require resumes again, but don’t worry, we are now offering FREE resumes along with our paid resumes. The key difference with our free resumes is that it is not searchable in our Resume Database, so churches will not be able to find you when they search our database. The free option will allow you to send your information to a church so they can get an idea of your experience. We strongly encourage you to check out our Premium Resumes because you will allow churches to find you, and we recommend Premium resumes to our churches. It really pays to Get Recommended. Churches who post a Gold Star Listing can now request a complimentary date reset if their position has not been filled in 3 months. That means your job listing will appear on the front page again for more exposure. Along with the many other features like Automatic Applicant Screening, Secondary Job Category, PSC Email Notifications, Temporary Listing Suspension, and more, ChurchJobs.net Gold Star Job Listings are the best way to manage your church employment search. You can literally manage your entire search from ChurchJobs.net. If you receive applications from another source you can simply ask the candidates to sign up for a free account, post a free resume, and apply for your job. All of their information will show up in the Application Manager where you can track all of your candidates. Premium Job Listings now come with twice the number of Recommended Resumes each time you login to My ChurchJobs. 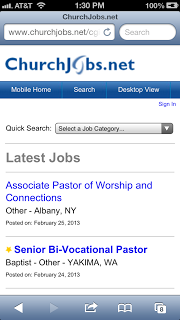 We have re-ordered the Latest Church Job Openings box on our front page. Premium listings are now listed first, and stay on the front page longer. We have added a new level for buying Bulk Jobs. You can now purchase packages of 3 Jobs which should make the new pricing more accessible to those who need it. Remember, our Bulk Jobs are all at the Gold Star level so you really save when you buy in bulk. Purchase a Gold Star Job Listing today to start using our unique tools! The ChurchJobs.net mobile site continues to grow as more and more people get smartphones. If you come to www.churchjobs.net on your phone, our site should auto-detect that you are using a smartphone, and redirect you to our mobile site. You can search for and apply for church jobs and pastor jobs on our mobile site, as well as contact us, and check your account info. Posting job listings and resumes still requires a desktop browser, but we will be working on those features in the future. 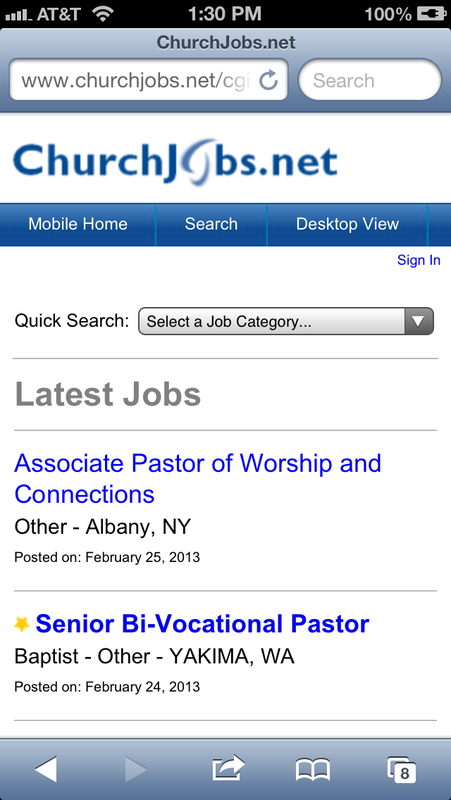 While on the mobile site, you can click on “Desktop View” at anytime to view the full version of ChurchJobs.net. As always, please let us know if you have any issues with our sites. We’re always open to suggestions too! If you want to get the latest job openings delivered to your inbox you have a few different options. You can set an Email Alert to be notified of each job posted in a selected category. Each time a job is posted, you will receive an email. To setup your Email Alert login to My ChurchJobs and look for the Email Alerts link in the top right menu. Once you select your category, you’re done. Lastly, you can sign up for the Experiencing Worship Newsletter. You will receive our latest job openings, as well as original worship related content from ExperiencingWorship.com. Go to the following link and look for the Experiencing Worship Newsletter sign up form. By request we’ve added a new feature to the Resume Database. Churches can now search the database for records added in the last 30, 60, 90, or 120 days. 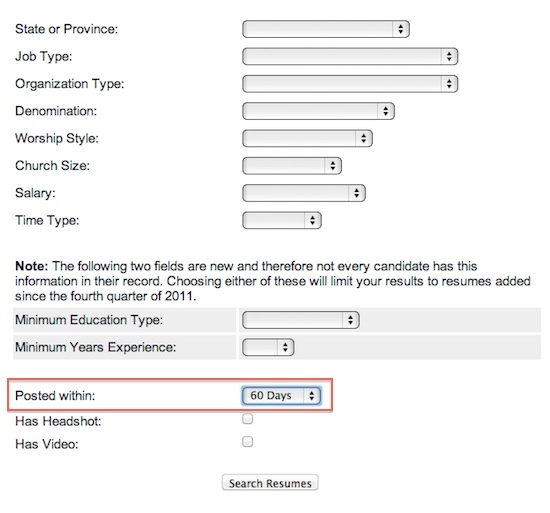 This allows churches to narrow their search to the most recently added resumes. We work to keep our database up to date and accurate but sometimes older records get through the cracks. 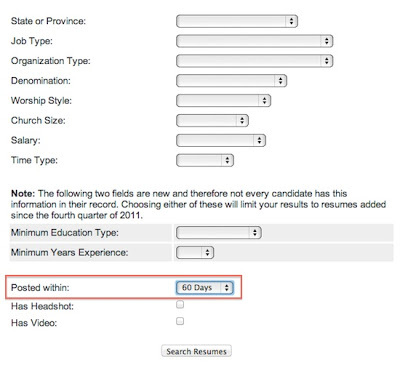 This feature will help churches quickly narrow in on candidates who have most recently posted resumes.